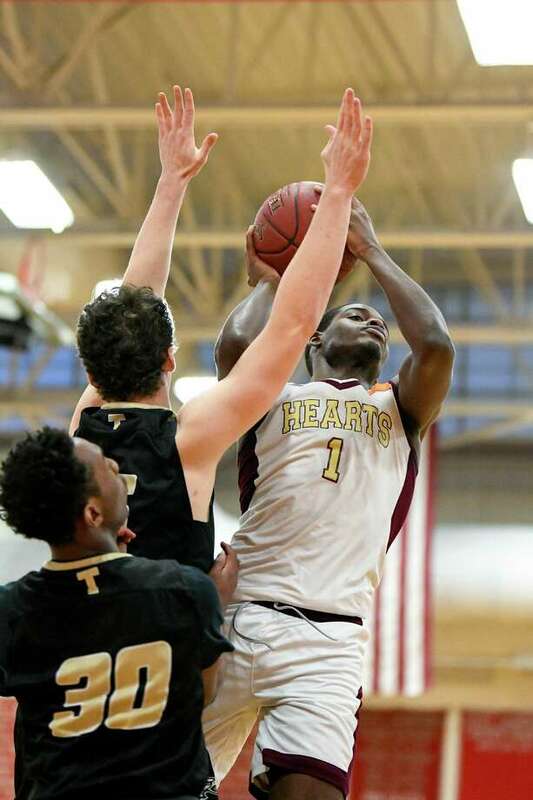 Trumbull beat Sacred Heart 73-66 during a CIAC Division I boys basketball quarterfinal on Monday, March 11, 2019 at Pomperaug High School in Southbury, Conn.
SOUTHBURY — Trumbull’s boys basketball team used a 20-4, fourth-quarter run on its way to upending top-ranked and No. 4-seeded Sacred Heart, 73-66, in a Division I quarterfinal game on Monday night. The No. 5-seeded Eagles, now 19-3, will be playing in their first state semifinal since 1974. Timmond Williams scored 31 points. Chris Brown had 21 and Mileeq Green 10. Sacred Heart, the NVL champions who had been ranked No. 1 in the GameTimeCT Poll all season, finishes 23-2. The loss marks the first time since 2013 that the Hearts won’t be playing for a state championship Mohegan Sun. Nate Tabor led the Hearts with 20 points. Jamaal Waters and Omar Rowe each scored 13. Down 59-53 with 6:20 remaining, Trumbull outscored the Hearts 15-1 over the next five-plus minutes. The Eagles, 26-for-33 from the foul line, connected on 18 consecutive free throws after missing their first. Sacred Heart managed only 26 points in the second half after holding a 43-36 halftime lead. Williams finished with 12 rebounds. Evan Gutowski had six boards and blocked three shots. Quentar Taylor had six assists. The Hearts broke on top 7-1 with Nate Tabor doing the damage. A pair of hoops by Gutowski brought Trumbull back level. The game was tied four times the rest of the period, with Williams scoring eight consecutive points at one stretch for the Eagles. Waters had six points, including a pair of dunks for Sacred Heart. Williams had 11 points in the stanza as Trumbull led 25-24 after one. Mileeq Green had seven. Waters scored 10 points in the second period and Rowe banged home a late three-pointer to give the Hearts a 43-36 lead at the half. Brown scored seven points in the frame for Trumbull. Brown had eight, Williams seven, but it was Green and Taylor running the show in the third period that saw Trumbull get within 56-53 at the end of the stanza. The Hearts flirted with an eight-point advantage three times but never could get past six. Brown had eight points to lead Trumbull back from a 47-41 third-quarter deficit. Tabor’s put-back bucket beat the horn and gave the Hearts a 56-53 lead with one quarter to play. Brown’s steal and layup in traffic tied the game for the seventh at 59-all with 3:20 remaining. Williams’ run-out hoop after a blocked shot by Brown was the game’s seventh and last lead change.